Love this! leaves hair feeling and looking great! Lots of shine, very smooth, and best of all if you have a little dry scalp the conditioner has tea tree in it!!! I love this product and it works well however the downfall is the price! this stuff is wayyyy expensive and while i liked the clean feeling of peppermint in my hair it didnt do that much! I have really thin hair and it helps maintain color and keeps hair soft. 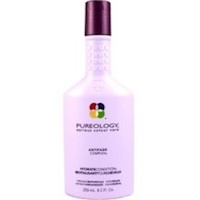 Pureology hyrdate conditioner is what most of the hair salons and spas use in my area. It leaves my hair feeling shiny and smooth, yet it is lightweight. Because it contains tea tree oil, it minimizes the dry, flaky effect on the scalp. I plan to use this in the wintertime! Hydrates from the first use. Will definitely use again. I highly recommend this especially if you have color-treated hair or a sensitive scalp. Pretty pricey but a little goes a long way.